On behalf of the Roshei Yeshiva, the Ramim and everyone here at Yeshivat Har Etzion, we wish you and your family our very best wishes for a Shana Tova. May it be a year of good health and happiness, spiritual growth, besorot tovot and shalom in every sense of the word for Klal Yisrael. The 42nd Machzor of the Yeshiva began its studies on Rosh Chodesh Elul with 45 Shana Aleph Hesder talmidim, 45 Shana Aleph and 25 Shana Bet talmidim from North America, 7 Shana Aleph and 9 Shana Bet talmidim from England, 1 Shana Aleph talmid from France, and a total of 26 talmidim from South Africa and Australia in the MTA program (19 Shana Aleph, 5 Shana Bet, 2 Shana Gimmel and 2 who made aliya and joined the Hesder Program). 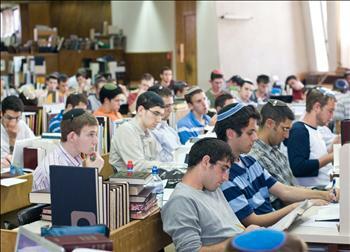 There are 17 returning talmidim from overseas, including 3 in the IDF Machal Program. The Darkaynu Program, coordinated by Shalom Ozarowski, Avi Ganz and Steve Gar '99, and three madrichim, has 10 students this year, beginning Yeshiva after Sukkot: 6 Shana Aleph students (from NY, NJ, Michigan, California, and Perth, Australia), and 4 returning talmidim, 2 Shana Bet and 2 Shana Dalet. We periodically send out emails to our alumni asking for personal news and professional accomplishments (if you know of any alumni who did not receive this, it means we need their current email). Baruch Hashem, this time we were so inundated with wonderful news that it took a long time to process and we are happy to include our most recent Mazal Tov and Alumni Achievement list. I hope you enjoy reading our alumni feature stories. Please send in your story to be featured in a future newsletter or suggest an alumnus and we will contact him. We are happy to report that the Yeshiva's website is being re-designed to better serve the needs of prospective students and alumni and we will inform you when it is up and running. The next printed issue of Etzion Update will be mailed in November. If you've recently moved, please email us your current address. Despite the difficult financial situation, the Yeshiva is making a valiant effort to expand its activities on behalf of the alumni and the community at large in Israel and overseas, through shiurim, lunch & learns, bar and bat mitzvah programs, Shabbatonim, Melave Malkas and other events. We hope alumni will take full advantage of these opportunities, thereby continuing to strengthen their kesher with the Yeshiva.